Previous Say Hello to Our New Editor! Hawkeye might be an Avenger, but the real superhero is Matt Fraction, the author of this new collection of Hawkeye comics. I tend to avoid traditional superhero comics, but I gave into the latest collection of Hawkeye, not just because he is arguably the lamest on-screen Avenger (notice I said on-screen, so let’s not get into a debate involving Ant-Man), but because the current author is Matt Fraction, one of the most beloved comic book writers currently out there. 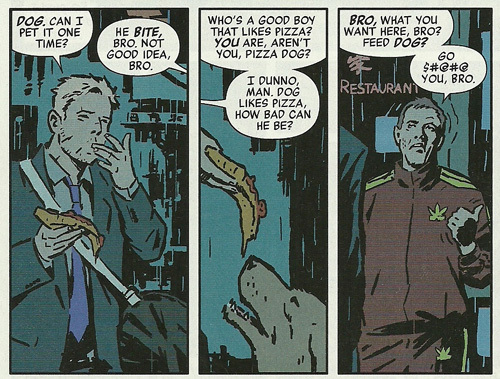 Hawkeye, in a suit, feeding a dog pizza. In my eyes, that's pretty heroic. I figured that Fraction, who is excellent on Twitter, as a caller to the The Best Show on WFMU, and as a comic writer (he also wrote an Iron Man series), would have a field day with Marvel’s grumpy archer -- who’s S.H.I.E.L.D.-mates all have super powers, god status, or at least a catsuit (Black Widow). The result, corny pun fully intended, was a bullseye. Author Matt Fraction in front of one of the more famous panels from the series, involving a certain almost-naked Avenger. Fraction’s Hawkeye is one of us mere mortals -- a little screwed up, insecure, and entirely vulnerable. The first pages of the first issue show him recovering in the hospital from a fall, wallowing in his normalness. To make up for his lack of super-skill, Hawkeye is a master archer – not only that, but one with a sad childhood origin story that is classic of any comic hero. These characteristics, along with his adventures are, for lack of a better term, slightly more realistic. Hawkeye is also incredibly funny -- and the stories, as Fraction tells them, are smart and artfully constructed. The lack of capes, holy hammers, and green alter egos make Hawkeye less impressive in some ways, but more relatable in others, and definitely less difficult for more superhero-adverse comic fan to get into. Where I once pitied Hawkeye, I now enjoy him, or least whatever Fraction does with him for now.